A very small portion of the Universe. 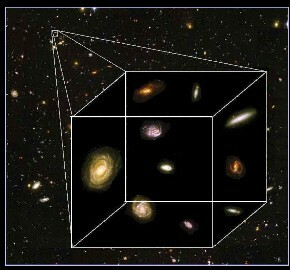 In order to better understand the significance of expansion, let's look at a cubic sample of space. By considering a finite volume we can follow changes in the size of the Universe as we move forwards and backwards in time. Remember, only the size of the cube will change. The galaxies inside the cube stay the same size. This animation illustrates how our cubic piece of the Universe changes with time. If the Universe followed the simplest expansionary models, its size would increase linearly with time. The Universe would continue to expand at a constant rate forever. If you look at only a narrow time-slice of the Universe's history, it does, in fact, appear that this is how the Universe expands.